Do kids prefer the interactives that an iPad offers or can a book still capture their imaginations? I think there’s enough room for both. 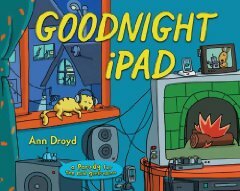 Everyone knows the classic Goodnight Moon, but have you read Goodnight iPad? Let me be clear: it’s a parody. Modern life is abuzz. There are huge LCD WiFi HD TVs and Facebook requests and thumbs tapping texts and new viral clips of cats doing flips. Wouldn’t it be nice to say goodnight to all that? Like the rest of us who cannot resist just a few more scrolls and clicks, you may find yourself ready for bed while still clinging to your electronics long after dark. This book, which is made of paper, is a reminder for the child in all of us to power down at the end of the day. This hilarious parody not only pokes loving fun at the bygone quiet of the original classic, but also at our modern plugged-in lives. It will make you laugh, and it will also help you put yourself and your machines to sleep. Don’t worry, though. Your gadgets will be waiting for you, fully charged, in the morning. Everywhere I go I see kids reading/playing/looking at gadgets and as adults know, it can be hard to tear ourselves away from them at the end of the day. Now there’s a book for that! Need it? Want It? Gotta have it? Click HERE to order. Both. I like to use my ipad at night because of the built in light. Speaking of the light that an iPad produces at night, there is some school of thought that the light for electronic devices later in the evening is detrimental to sleep. Do you find that to be true? I work on a computer 8 hours a day at my job, so I avoid glowing screens in the rest of my life. Oddly enough, owning an iPad has helped me with this because it’s easy to use it for just a moment–whereas my desktop computer takes a while to start up and a while to shut down, so once I’ve turned it on to send that one email I tend to think of other things to do on the computer to make it “worthwhile” to have turned it on…. I also appreciate that books don’t need to be charged and don’t use any power when you’re reading in daylight. I came here from Works-for-Me Wednesday, but it looks like you forgot to link back there. Love my books, no doubt. Thanks for coming by! I have no problem turning off the ipad or iphone at night. Usually, I finish u[ around 9:00 unless it is something I really have to finish. My grand daughter has this book and when I am there we read it all the time and talk about how you need to stop doing all of that “connecting” at night. Fortunately, my son and daughter-in-law only allow so many minutes of computer or phone time per day. It’s such a great idea presented in a fun way. Win win! hilarious and a great idea! I have to check this out, thanks! Several mommas have said they have it and love it! I gotta get one for Sweet E! I’ve read this! It had me cracking up the whole time. I must say I prefer the original classic version, though…call me old fashioned! 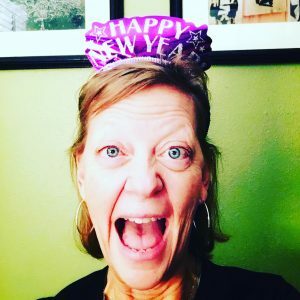 😉 I popped over from Practically Functional–thanks for sharing! Can’t replace an original, but I’m always up for a good parody. I recently saw this book and couldn’t resist buying it. I am flabbergasted by how addicted kids become to iPads at a very young age! Definitely a generational change, and a big one at that! I prefer books, my children like both, found you on the Oh what a Happy Day party! following you! Sounds like a fun book — and we do love to read around here! Thanks for the suggestions! Love to pass along great ideas! As a school librarian I love the book “It’s A Book” by Lane Smith. The short version in on youtube. I read the book to my 6th graders to remind them that there’s no electricity involved and that it actually has many more advantages. For kids there may be some future problems with using tech at a young age too- what will they do if they don’t have acess to that later? Public schools can’t afford to buy kids iPads just because they want to use one in school. How many parents are going to trust a elementary kid to take theirs to school? Who will pay for it if it gets broke/stolen/damaged? I can’t afford an iPad and if I did I wouldn’t buy one. I have 2 computers at home and 2 at work. I have lost count how many times I have almost been hit by cars whose drivers are texting. It’s just too much. There’s also such a disparity between people who just assume all families can even AFFORD these. I work with 85 % high poverty kids. Only about 30% of them even have the internet at home. $500.00 for an iPad is groceries and rent for them. There’s a huge disconnect (excuse the pun) in tech where wealthier folks just assume everyone has one. Or wants one, in my case. I love the convenience of tech, but it’s too much- $, maintenance, wear and tear, storage. I don’t have to worry about dropping a book, getting it a little wet (assuming I own it), highlighting it, tearing out a page, my software crashing (a friend lost his entire kindle off his iPad), re-charging, worry about theft. I could go on. It just needs to be put into perspective sometimes. ***Remember- with no electricity, it’s just an expensive piece of plastic. While it’s true not everyone can afford all technology, I think it’s also true that it is the future of where we are/headed and those who are not familiar with it will be at a disadvantage. Many schools are dong the best they can with the resources at hand. Will some kids have to share? Most likely, but that doesn’t mean they shouldn’t be exposed. I am a lover of physical books too, and I hope I never live in a world where I can’t get my hands on one. I’m also a lover of a good parody, which this book is. Technology with all its pluses and minuses is here to stay, I say we do they best we can with what we have, and enjoy the fun where we can as well. I’m just happy kiddos are still reading! I have a passion for books! I have a passion for reading! I have a passion for getting children to read! So, if it is a book or an iPad, I’m all over it! Exactly my thoughts! Thanks for joining the conversation. I just see up close everyday that many families can’t afford tech, and others can’t/won’t share. I see this as another disconnect (excuse the pun) between the haves and the have nots. If schools rely too much on tech to teach there will always be a break down, and does this promote a shorter attention span in kids? Special Ed teachers have complained for years about things like baby einstein and how it has such a negative effect, promoting adhd type behaviors. Mrs. Tucker, I grew up sans technology so I still prefer the smell and feel of a good ‘ol book! Times are changing though. My sisters kids LOVE the iPad! I’m with you. If I’m reading a book, it’s in my hands and not on a screen. Although, if Santa brought me an iPad, I’d be polite and use it! We love Goodnight Moon, but I’m going to have to check out Goodnight iPad now! Thanks for sharing!